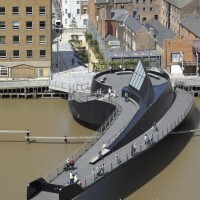 McDowell+Benedetti Architects have designed the Scale Lane Bridge, a swing bridge over the River Hull in Kingston upon Hull, England. 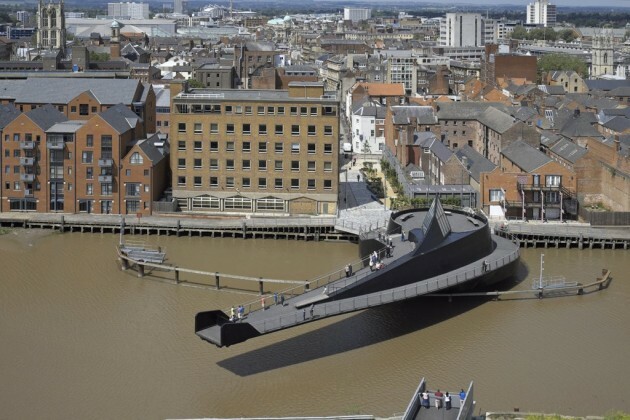 An innovative swing bridge over the River Hull has opened to the public, offering pedestrians the unique experience of riding on the bridge as it opens and closes to river traffic, a world’s first. 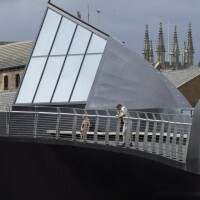 The winning entry in an international 3-stage design competition held in 2005, the bridge has been built to the original concept by the competition team, architects McDowell+Benedetti, structural engineers Alan Baxter Associates, and main contractor and M&E engineers Qualter Hall. 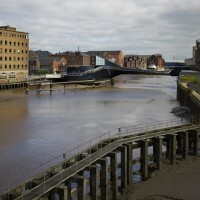 Located in Kingston upon Hull, east of Hull city centre, the bridge connects Hull’s Old Town Conservation Area to the undeveloped industrial landscape of the east bank. 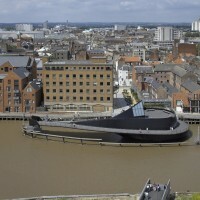 The bridge provides a walkable route connecting the Museums Quarter on the west bank to Hull’s major attraction The Deep. 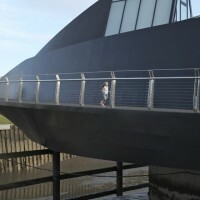 The bridge’s sweeping form creates two generous pedestrian routes, one gently sloping and a shorter stepped walkway. The roof of the drum provides an upper viewing deck with a seamless steel balustrade, which gives the feeling of being on board a docked ocean liner. 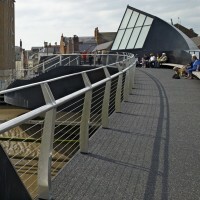 The central structural spine of the bridge includes seating areas, creating a variety of places for people to pause on route to relax and enjoy the riverscape views. The spine rises into a back-lit rooflight which provides a marker at night. 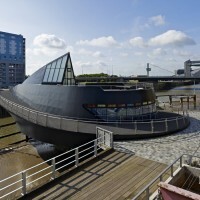 The bridge rotates using an electrical drive mechanism to open the route to river traffic when required. 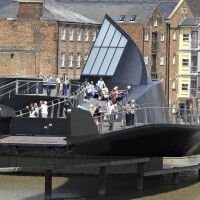 When activated the mechanical movement of the bridge is sufficiently slow to allow passengers to safely step onto the bridge from the west bank whilst it is rotating. 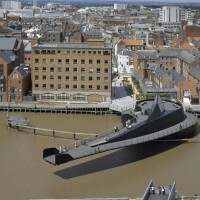 Artist Nayan Kulkarni has created a public artwork on the bridge, a sonic landscape in which to enjoy the riverscape. When the bridge opening is activated a new sequence of rhythmic bells is triggered which increases in urgency and combines with a pulsing light developed by lighting consultants Sutton Vane Associates. This has a practical purpose in alerting pedestrians to the imminent opening rotation and it heightens the drama of the ‘ride’.